The world of the first-born child differs markedly from that of the second born, and if a third comes along, he or she will carve out territory within the family system that differs from the first two. This is not to say that these patterns are carved in stone – there are always exceptions to the rules. For example, if the first two children are born close together and the third child comes along much later, the last-born may have characteristics resembling the first-born. The gender of the children and physical differences can also make for deviations from the general patterns, as can the birth order of the parents and the nature of the relationship between the parents. And, of course, two families who come together through the remarriage of the parents (the blended family) can create all sorts of interesting combinations. Researchers have been interested in birth order for nearly a century now, but learned only within the past few decades about the influence of birth order on our behavior and the nature of relationships with our partners. Consider two parents, possibly newly married, who have their first child. Determined to be the best parents in the world, they dote on the child, give the child an abundance of attention, and try to show just how responsible they are. They want to be perfect parents and they want the child to be perfect – and it’s a lesson the child learns well. First-borns often grow up with perfectionistic tendencies, and they strive for approval and success in the adult world. The second child usually doesn’t get nearly the attention received by the older sibling, and, deviating from the pattern already established by the first born, this second child will often go outside of the family constellation as they grow up. The support of their friends becomes more important than the approval of the parents. By the time the last born child comes along, the parents have loosened up considerably in their child-rearing practices and tend to indulge this child – so the baby in the family, having learned of his or her special status, may grow up to be attention seeking, perhaps manipulative, people-oriented, and a charmer. While parents of the first newborn are usually responsible and diligent, they are also tentative, anxious, and inconsistent – and to make up for this they may be demanding, strict, and overprotective. Research shows that first-borns talk and walk before children who are born later. As first-borns grow up, these precocious abilities remain – they are the ones who go on to succeed in the world. They get higher grades in school and have stronger leadership and achievement traits. They are conscientious, organized, dependable, accommodating, and persistent. While some first-borns have a strong need for approval, so that they grow up pleasing people and taking care of others (often being taken advantage of in the process), other first-borns are high achievers, hard driven, and ruthless. One common characteristic of many first-borns is that they tend to be perfectionists. They strive for unrealistic goals, don’t deal well with criticism, are devastated by failure, are frequently pessimistic, and take on so many responsibilities that things can go out of control. As each child is born, the disciplinary rules of the family relax – as well as the expectations and pressure put on those born later. Middle children may have many contradictory characteristics, but one common thread seems to hold true – their personalities are usually the opposite of the first-born’s. If the first-born is a loner, the next born will have numerous friends. If the first-born is ambitious, the second-born may be more laid back. The second-born, after all, has to carve out his or her own distinct identity, and the first-born has already made a claim on adult-oriented and ambitious traits. It is common for the middle child to feel squeezed out, with the older and younger children getting more attention – so they turn to the world outside of the family, to their friends. Second-borns or middle children are often sociable and become good mediators. They learn the art of negotiation and compromise. They are generally free-spirited, independent, and sometimes rebellious. Because they don’t get as much attention, they learn not to reveal as much about their thoughts and emotions as others do. And since they didn’t stand out in the family as much while growing up, they place great value on loyalty – they are the likeliest to remain monogamous in their relationships. By the time the last child is born, the parents often let the child’s development proceed with more of a hands-off approach. Frequently the older brothers and sisters involve themselves in the child-rearing process – which means that the last-born gets an abundance of attention and is often the target of jokes. There is some inclination as well to let the last child remain a child – after all, once the last-born grows up, the parents have to come to terms with new roles and definitions within their own relationship, a situation they may prefer to avoid. Last children grow up with ambivalence, lauded with attention one minute and joked about the next. They are accused of being spoiled, the ones who get everything the other siblings never had. This results in some impetuous behaviors and a tendency to want things immediately. They can become “clowns,” seeking attention with no real worries about the consequences. The last born child is often described as sociable, charming, loving, and open, but also as temperamental, irresponsible, and self-centered. remain with us and can cause conflicts in our relations with other people later on in life. 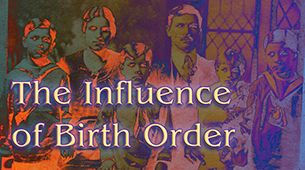 Birth order has a significant influence on our behavior in adulthood. The tactics we developed in childhood to deal with other members of the family remain with us and can cause conflicts in our relations with other people later on in life.Others may judge us as too ambitious, selfish, withdrawn, irresponsible, or opinionated – and we may wonder why others would even see these attributes as problems! One of the major goals of therapy is to understand how our development has affected our personalities as adults and see how these influences have slanted our ways of dealing with other people. Despite the heavy impact birth order has on us, we can learn to change some of these behaviors and, if change is not indicated, then at least to use our special attributes to their best advantage. which in turn can lead to intentional change. Only children may carry the characteristics of both first-borns and last-borns. They are referred to as “lonely onlies” because, while they receive substantial attention from their parents, they frequently find themselves with fewer social skills for dealing with their peers. Because they identify so closely with the values of their parents, they relate better as they grow up with people far older or younger. Think of the characteristics of the first-born and then magnify them. Their lives are often highly structured during childhood so they may harbor private resentment about having to grow up as little adults with no real childhood. Only children grow up with a great deal of recognition from their parents and tend to be responsible, ambitious, and perfectionistic, but they also set high standards for themselves and others so that they may be perceived as critical or even controlling. When we have a partner within the same birth order, we often experience frustration that this person does not have attributes we ourselves lack. Many people come into relationship therapy expressing aggravation toward a partner, complaining, “Why can’t John (or Mary) be more responsible (or outgoing...or emotionally open)?” Ironically, these are likely the same qualities lacking in the one doing the complaining! At a certain level we often look to our partner to make up for the things we don’t do well, so we resort to the scheme of trying to change our partner. A word to the wise, however – we cannot change another person. It is difficult enough to change ourselves. We cannot change another person. It is difficult enough to change ourselves. You can, on the other hand, change many things about yourself and your behavior with the help of a therapist, and your partner may decide voluntarily to do the same. If you have a partner with complementary attributes, there will be less need for him or her to change within your relationship. You can value each other for your own special qualities, and this leads to a strong and healthy bond. Two first-borns or two only children may find themselves in a volatile and competitive relationship, especially when both have tendencies to be perfectionists. They hold high standards for themselves and may find it difficult to back down. First-borns, unlike second-borns, often failed to learn the art of compromise. While two middle children in a relationship may be good mediators, seemingly a wonderful skill to bring to a partnership, they may avoid talking through the problems that come up in any relationship. Middle children want things to be smooth and are generally loyal to a fault. They learned how to avoid conflict growing up, which meant keeping things to themselves. Their relationships, therefore, may be characterized by a lack of communication. Two last-borns together can make for a wonderfully playful relationship, but eventually each partner may look to the other to take control of things – and nobody wants to take the control! Last-borns grew up with older siblings who took responsibility for decisions and chores, so they may still expect in adulthood that someone else will take care of things. Last born partners sometimes have money problems. So, which birth order makes the ideal partner? It depends on you. There are no hard and fast rules. Some people say that a first-born with a last-born provides for a good mixture of responsibility and playfulness. Others say that a first or only-born with few friends can benefit from a relationship with a socially-oriented middle child. Tempered by a good dose of common sense, the answer lies in your heart. (paperback) 2009, $15.99, ISBN 978-0800734060r. You can have high standards and expectations without being a perfectionist. Try loosening up a bit, and don’t expect that others should adhere to the same standards that you set for yourself. Set aside some time for yourself. Play and enjoy life. Cultivate the part of yourself that experiences life fully. When people try to influence you to take risks, stick with your first inclination – which is probably to be cautious. Take pride in your ability to be responsible. Learn to laugh at yourself. Sometimes you’ll be wrong – just admit it! You may find yourself comparing yourself with other people much of the time. Just rejoice in being yourself. Like yourself for who you are and what you have in life. While you may not have talked much about yourself growing up, there is never a better time than now to begin. Explore feeling comfortable in sharing your thoughts and feelings with other people. While you may value your freedom and independence more than most, that doesn’t mean that you’ll never be successful. Find ways to express your freedom responsibly in your work and relationships. You don’t have to be a friend to everyone. Select a few people who deserve your time and true friendship. When everyone is a friend, nobody is a true friend. Rather than expecting others to take charge or blaming other people when things go wrong, explore how it feels to accept complete responsibility for things yourself, not only with major decisions but with the smaller chores of daily living. While you may love to be the focus of attention, try sharing center stage with other people. Try listening to other people to benefit from their point of view. Evaluate your work. If you work alone or in an isolated job, remember that you are probably not utilizing one of your greatest strengths, which is your ability to work well with other people. Your ability to be entertaining and influential around others is a wonderful asset – but learn to use it for the benefit of other people, not just for your own gratification.